You usually get a wider field of view with an 8-power binocular than you do with the same model in 10 power. 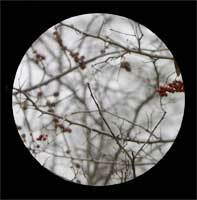 For spotting a bird through binoculars, all you have to do is get the bird anywhere in the image. A wider field of view makes it easier to spot a songbird among the branches (or a seabird on the waves). In the images above, the magification is greater on the right, with 10-power binoculars. But notice that more of the scene is visible in the left picture. You see the whole cardinal. In the right-hand image, just the tip of the cardinal's wing is visible, at the 2 o'clock position. In general, it's easier to locate a bird with lower-power binocular. 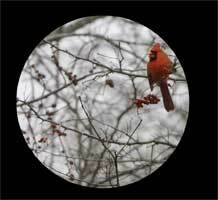 This is one reason that 8-power binoculars are popular among birders, even though 10-power gives higher magnification. The field of view is determined by the design of the eyepiece, not by the size of the objective lens. Interestingly, the smaller, lighter-weight 8x32 version of a line of binoculars usually has the widest field of view of all. The Vortex Diamondback 8x42 is a lower-priced binocular with a wide field of view — 420 feet at 1000 yards. This is one of our best selling binoculars, and for a good reason. It has good optical quality, it's waterproof, it's economical, and it has an unconditional lifetime guarantee. The Swarovision EL 8x32 binocular, from Swarovski, has a 423-ft field of view at 1000 yards. Optically, there is no better binocular.